First daughter Audrey Rhodes can't wait for the party she has planned for Friday night. The decorations are all set and the pizza is on its way. But the Secret Service must be out to ruin her life, because they cancel at the last minute-citing security breach and squashing Audrey's chances for making any new friends. What good is being "safe and secure" if you can't have any fun? Audrey is ready to give up and become a White House hermit, until she discovers Alice Roosevelt's hidden diary. The former first daughter gives Audrey a ton of ideas for having fun...and more problems than she can handle. Thanks for doing this interview! 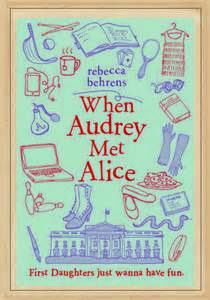 When Audrey Met Alice has been one of my favorite middle grade novels of 2014. Thanks! That is so nice to hear, and I’m glad you enjoyed it! 1. I love the concept of When Audrey Met Alice. I was drawn in from the very first line. How did you come up with the concept for the book? Thank you! I’ve always been fascinated by children living in the White House, and when President Obama was elected in 2008, I thought a lot about how the lives of his young daughters would change as they headed to Washington. I wondered if being a First Daughter, as exciting as that is, might also be lonely. The idea of a First Daughter feeling a little isolated developed into Audrey’s character. At the same time, I was very interested Alice Roosevelt’s wild life at the turn of the century. I wanted to write about a First Daughter, but I couldn’t decide whether I wanted to write about Alice or a contemporary girl. One day when I was out for a brainstorming walk in New York, it hit me: I could combine Alice’s story with that of a contemporary First Daughter, via a long-lost diary. This is where my inspiration story gets strange: I found out later on that Alice’s aunt had lived at the very intersection where the concept for When Audrey Met Alice came together, and Alice spent plenty of time there as a young person. Weird! 2. Are you more like Audrey or Alice? How so? I wish I were more like Alice--I've love to be a thimbleful as witty and daring as she was. I am more like Audrey: curious, thoughtful, and cookie-obsessed. Hopefully, I showed that despite the extraordinary circumstances of their lives, both were normal girls who occasionally felt frustrated, unsure, or insecure--like every kid does at some time or another! 3. What made you choose to write for an upper middle grade audience rather than YA? Writing the first draft, I wasn't sure whether this book would be middle grade or YA. That version was firmly stuck in between the categories. Ultimately, even though Alice would make a great YA heroine, I decided that this is Audrey's story--and she had a strong middle-grade voice. I do a lot of research early on in the writing process, and even more as I start drafting and revising. I usually write an outline before I start writing, but it always changes as I go along (I like it when the characters or plot surprise me). My favorite part of the writing process is revising. That's where it feels like the story really comes to life, and I can shade in all the details. 5. What has been the most surprising thing you’ve learned during your publishing journey? I learned that despite being a rather shy person, I love to talk about writing this book--especially with kids! My own enjoyment of the in-person promotion I've done surprised me. There is nothing quite as fun as getting to meet readers. 6. What has been the best writing advice you’ve been given? You have to read to be a writer--and it helps to read outside your category/genre. Not only does it help you grow your craft, but inspiration can come from unexpected places. An article I read in Smithsonian magazine about baseball inspired a short story that I wrote for Scholastic Scope--and I'm not even a baseball fan. 7. Do you have a sophomore novel in the works? If yes, can you tell us about it? 8. Lastly, other than your own novel, what has been your favorite debut author read of 2014 thus far? I've read so many fabulous debut novels so far this year, and it's too hard to choose one! Skila Brown's Caminar is a powerful MG verse novel. Foodie fans of MG will love Tara Dairman's All Four Stars. It inspired me to take more writing breaks in the kitchen. I also loved Brandy Colbert's heartbreaking, gripping YA debut, Pointe. Ready to read? Enter now for your chance to win a signed hardcover copy! (US and Canada only) And be sure to add When Audrey Met Alice on Goodreads or check it out on amazon.